Large carnivore exhibition -most wanted! Our Large carnivore exhibition which was opened for the first time on the 08 of May this year and had a great success, continued its way in Ukraine. The first venue of the Exhibition was Transcarpathian Regional universal scientific library in Uzhhorod and now it changed to outdoors and was shown on the International hunter´s day in Vynohradiv sub-region in the so-called Big Forest area. European Wilderness Society´s exhibition found its personal place on the Festival´s location “Forest fairy tale” together with other various attractions and educational materials, organized by our Ukrainian Partner NGO FORZA. 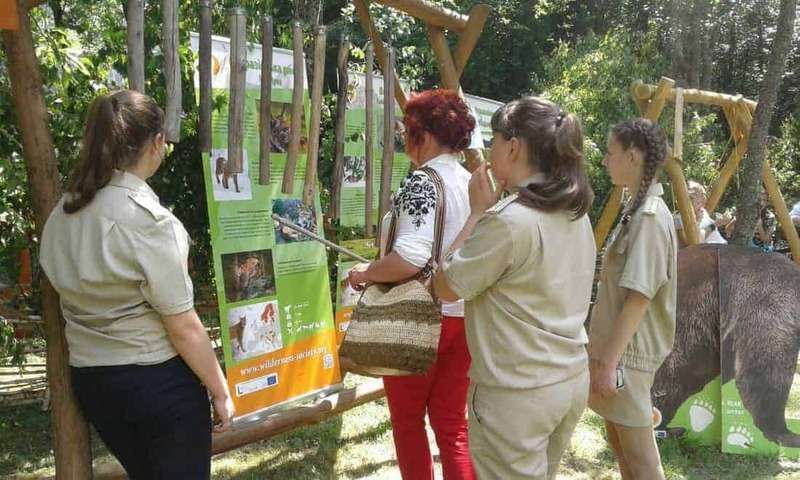 Our wooden Bear, Wolf, Lynx and Golden Jackal attracted visitors for close look, touch and photo, roll-up banners increased their knowledge about these carnivores, their habitat and co-existence with them. Our other local partner National Nature Park “Zacharovanyy kray”, member of the European Wilderness Network, took part in the Festival as well. Its educational department specialist, Iryna Popovich, who recently received the Wilderness Advocate Certificate, and working hard together with European Wilderness Society on establishing permanently functioning Junior Ranger Club under “Zacharovanyy kray” invited participants of this newly created Club to the event. Our Large Carnivore Exhibition´s next location will be above mentioned Zacharovanyy kray, where its visitors will receive more knowledge about these carnivores, presented in the Ukraine, will learn how to behave while encounter them as well as about European Wilderness Society, European Wilderness Network and Herd Management. And every time visitors can strengthen their knowledge with the help of our popular educational journal Wild 5 , which beside provision of information about climate change, wilderness, protected areas, large carnivores and encounter with them also inspires young artists for such paintings. We are receiving other orders for further holding of this efficient, informative, but also easy-travel Exhibition and hopefully very soon with the support of Ukrainian proper institutions or other donors more interested protected areas, clubs and schools will receive their own Large Carnivore Exhibition set. Why do we recommend blue fences to protect sheep?